Click the image to learn more about the issues in LAUSD. 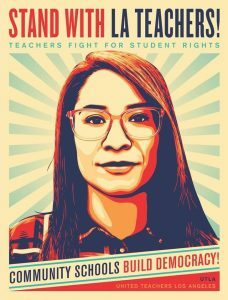 On January 9th, 2019, KPFA radio aired interviews with teachers from LAUSD, providing some great insights into the reasons and preparations for the likely strike on January 14. There are also teachers from the Bay Area speaking to similar issues beyond L.A.
I’m 100% supportive of the collective bargaining and concerted actions being taken by the teachers union in Los Angeles, UTLA. I encourage you to listen to these interviews using the media player below (or download it here) to better understand the teachers’ positions on important issues of educational quality and even the viability of LAUSD as a public school district.